If you find that Your Aadhar Details are Wrong or have any mistake. If Yes, Then you are in the right place. In this tutorial, you will know all about Aadhaar SSUP Update. SSUP (Self Service Update Portal) is an online service provided by UIDAI to self-update your information on Aadhar. Aadhaar Self Service Update Portal is a platform provided by UIDAI to update or make a correction on Aadhaar card online. You can update your Aadhaar card by two method. 1. Visit UIDAI SSUP UPDATE section. 2. Click on Update Address. 3. 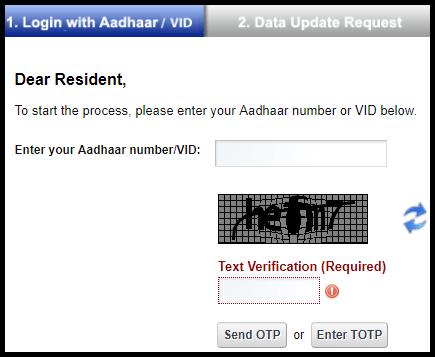 Enter your Aadhaar number or VID virtual Aadhaar ID. 4. Enter Text for verification as shown in box. 5. Click on Send OTP. Then you will receive OTP on your registered mobile number. 6. Or Click on enter TOTP. 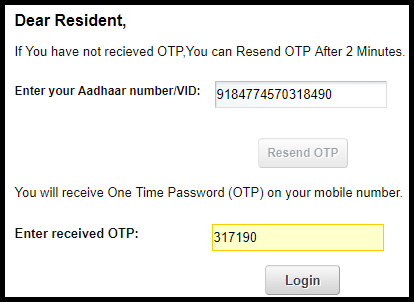 NOTE: You can generate TOTP through the mAadhaar app. 7. Enter OTP or TOTP and Click on Login button. 8. Select the relevant option through you want to update Aadhaar via SSUP portal. 9. Click on the Submit button. 10. Enter correct information in SSUP update portal. 11. Recheck your information and click on Submit Update Request. 12. 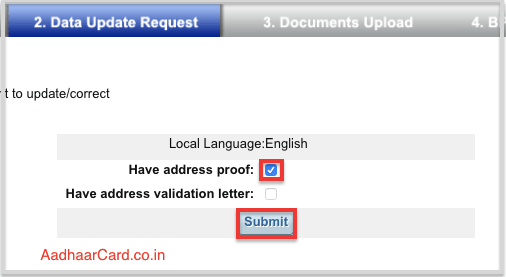 Browse your Valid Proof of Address from all the options and Click on Upload. 13. Select YES or NO as per above questions. 14. 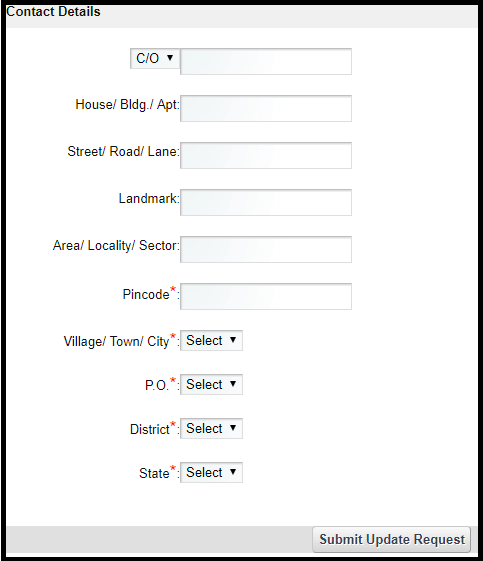 Select the BPO Given on the Screen and Click on Submit. 15. Recheck your information and click on Proceed. Now a Message will appear “Update Request Complete” with the option to Download or Print your Update Request Number(URN). Never forget to collect URN (Update Request number) as it helps in Checking Aadhaar status. Once your Aadhaar information is updated you can download e-Aadhar easily through UIDAI website. You can change your demographics (Name, Address, DoB, Gender, Mobile & Email) and Biometrics (Finger Prints, Iris & Photograph) by visiting the nearest enrollment centre. You need to carry your original documents for further requirements. #1. Fill the Aadhar correction form. #2. Make sure you enter that information which is correct and not the one that is mentioned in your Aadhaar. #3. Get self-attested copies of proofs validating your update request. #4. Submit the form along with documents. You can get all your details including your biometric data, image, mobile number, etc. updated at the enrolment centre. Updating Aadhaar online and by post can be done free of cost. However, if you are visiting an enrollment centre for the correction/update, you need to pay a fee of Rs 25 every time you get your details updated. 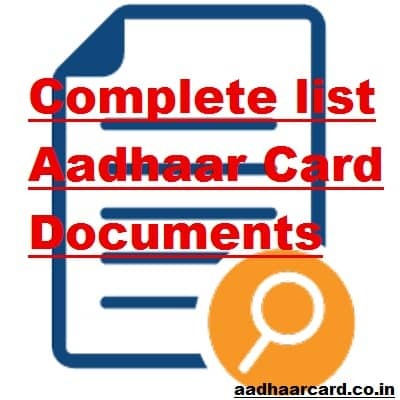 Here is a List of Documents required to be Uploaded for Aadhar Verification Process.